In fact, the revolutionary influx is still underway, and it will take many years before the achievements of these popular mobilizations be truly felt. One can understand the frustration and deep sense of disappointment resulting from the state of chaos in Libya, the political wrangling in Yemen and Tunisia, the brutal civil war in Syria, and of course, the collective heartbreak felt throughout the Arab world following the bloody events in Egypt. But to assign the term “failure” to Arab revolutions is also a mistake equal to the many miscalculations that accompanied the nascent revolutions and uprisings from the start. Many lapses of judgment were made early on, starting with the lumping together of all Arab countries into one category — discussed as singular news or academic topics. It was most convenient for a newspaper to ask such a question as “who’s next?” when Libya’s Muammar al-Gaddafi was so pitilessly murdered by NATO-supported rebels. It is equally convenient for academicians to keep contending with why the Egyptian army initially took the side of the January 25 revolution, the Syrian army sided with the ruling party, and while the Yemeni army descended into deep divisions. While answers were readily available of why the Arabs revolted, time has proven much of the early discourses inane and misleading. The direction of these revolutions has headed in sharply different ways. This a testament to the uniqueness of circumstances, historical and otherwise, which surround each country — as opposed to the wholesale representation offered by the media. It is an argument I made soon after Tunisian president Zine El Abidine Ben Ali fled the country. My argument was a response to the euphoria of expectations made by media “experts” and journalists who clearly had little understanding, or dare I say, respect of history or knowledge about the complex realities in which each Arab country is situated. Many went on to write books, while others inspired audiences around the world with fiery speeches about collective Arab Islamic awakenings even before we conjured up basic ideas of what was truly manifesting before our own eyes. These manifestations were at times very violent and involved many players, from Qatar to China, and groups so varied in roots, ideology, and sources of funds. But as the plot thickened, much of the distorted accounts of “twitter revolutions” and such, grew less relevant and eventually faded away. Take the case of Libya as an example. Those with simple answers, reflecting truly modest understanding of Arab societies, could hardly understand the complex nature of Libya’s tribal society, the socioeconomics governing relations between East and West, urban areas with desert towns, and Libya’s African context and relationships. When NATO used the Libyan uprising, mostly in the eastern parts of the country, to achieve its own political objectives, it converted a regional uprising into an all-out war that left the country in a status comparable to that of a failed state. Almost immediately after NATO declared the Libyan revolution victorious, the excitement over the Libyan component of the “Arab Spring” became less visible, and eventually completely dissipated. Since then Libya has hardly followed a path of democracy and reforms. In fact, the harms that resulted from the Libyan crisis, such as the massive influx of weapons and refugees to other African countries, destabilized the entire country of Mali. As a result, Mali too went through its own upheaval, military coup, civil war, and finally a French-led war in the course of two years. Unfortunately, these issues are hardly discussed within the Libyan context since Mali is not Arab, thus such inconvenient stories do no service to the simplified “Arab Spring” discourse. The consequences of the Libyan fiasco will continue to reverberate for many years to come. But since simple arguments cannot cope with intricate narratives, media “experts”, and other intellectual peddlers have moved elsewhere, selling the same tired arguments about other Arab countries by insisting on the same failed, expedient logic. Was the Arab Spring an Entire Farce? 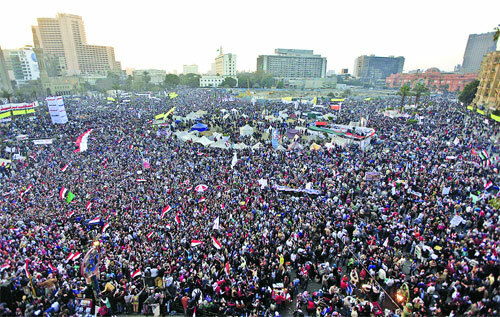 While some parties continue to ascribe the same language they used in the early months of 2011 to these revolutions, the shortcomings of these revolutions eventually gave credence to those who insist that the “Arab Spring” was entirely farce — incepted, controlled and manipulated by US hands, and funds of rich Arab countries. These critics either have no faith in Arab masses as a possible factor of change in their own countries, or have been so accustomed to judging the world and all of its happenings as a colossal conspiracy where the US and its friends are the only wheelers and dealers. Arab revolutions have not failed, at least not yet. It will take us years, or maybe even an entire generation to assess their failures or successes. They have “failed” according to our hyped expectations and erroneous understanding of history. What popular revolutions do is that they introduce new factors that challenge the way countries are ruled. In post-colonial Middle East, Arab countries were ruled through dictators — and their local associates — and foreign powers. The harmony and clashes between the dictator and the foreigner determined the course of events in most Arab countries — in fact in most post-colonial experiences around the world. This is where the real significance of the mass mobilizations in Arab countries becomes very important, for the “people” — a factor that is still far from being fully defined — challenged the rules of the game and mixed up the cards. True, they sent the entire region into disarray, but it is the price one would expect when powerful regimes and foreign powers are challenged by long-disempowered, disorganized, and oppressed people.Arab revolutions have not failed, but they have not succeeded either. They have simply challenged the status quo like never before. The outcome of the new conflicts will define the politics of the region, its future, and the relationships between governments and the upcoming generations of Arabs.